Lawn Fawn's Cozy Christmas stamp set has the most adorable images. The fireplace and letter to Santa were stamped in black ink on scrap white cardstock, colored with Copic markers, then trimmed out and glued to the card base. 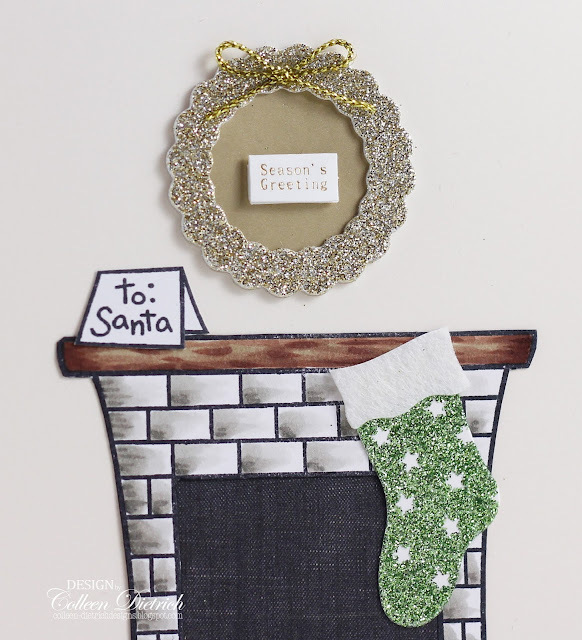 The golden wreath with tiny sentiment inside is a sticker by Jolee's Boutique, and so is the green glittery wreath. I lined the open area of the fireplace with a piece of patterned paper in a shade of charcoal. Purposely, I left out the color red on this card. Red and green, so common for Christmas. I thought I'd go with green and neutral shades instead. Thanks so much for coming by today! I appreciate you! The wreath and stocking are perfect for this image and so cute! I unearthed a few Christmas stickers when I was cleaning the other day. A fun find! Love your sweet sparkly scene Colleen! !